Pastor Chris Okotie of Household of God Church International, Lagos, has bought the 2014 Bespoke Edition of Rolls Royce Coupe, to mark his 30 years as born-again Christian and 27 years as a pastor. According to Pastor Okotie’s close aide, the flamboyant pastor spent N120m on the luxury car and had earlier spent N33m on a Range Rover Autobiography to mark a milestone of his church. “Pastor Okotie just bought a Rolls Royce Coupe, 2014 Bespoke Edition at N120m to mark his 30 years as a born-again Christian and 27 years as a pastor. 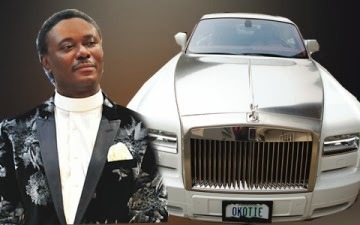 He had earlier bought a Range Rover (Autobiography) 2014 Model for N33m, reputed to be the costliest SUV in the world to mark this ministry’s milestone.”Fifty-five-year-old Okotie was in the news recently for his controversial comments during a church service in which he claimed that “all Catholics will go to hell,” and referred to Pope Francis as anti-Christ.